A ghostly skeleton in a shroud, with one arm upraised, holding a burning lamp, over a dusky, shadowy background…. Are you scared yet? You need not be, for this ghoulish scene unfolds on this enchanting Rookwood Pottery jug, and not on your street. 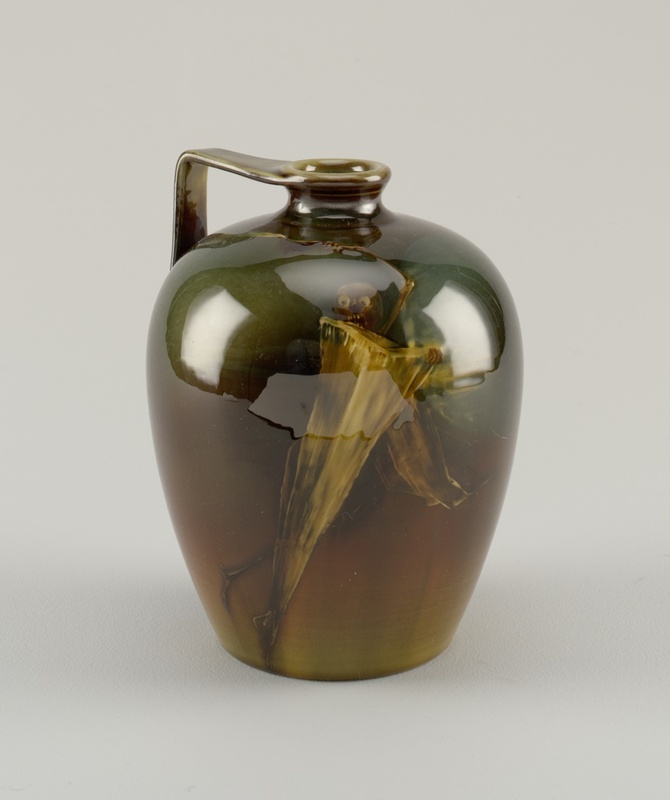 The ovoid jug was made in 1891 and is part of the “Standard” line by Rookwood, which is characterized by yellow-tinted high-gloss glaze, warm, golden colors, and low relief decorations. It was decorated by artist Matthew Andrew Daly, who was one of the first full-time decorators hired by Rookwood. The spooky design is surprising, but by no means unique at Rookwood. Indeed, other artists decorated wares with fairy tale creatures (engulfed by a giant spider web), ghosts, spiders, and bats. It may be that the surroundings of the Rookwood Pottery facilities, on Mount Adams in Cincinnati, were conducive to horror stories. It could also be that the decorators were influenced by the fondness of Rookwood’s founder, Maria Longworth Nichols, for the grotesque and the comic in Japanese art; indeed, the lustrous glaze of the jug brings to mind Japanese lacquer. Or else, the decorators may have found inspiration in the flourishing Symbolist art movement at the time, which favored spirituality, imagination, and dreams. Whatever the source of inspiration, this jug is certain to create an impression and spring to mind on Halloween night, full moons, foggy evenings…. Did you hear something? Jug; 1891; designed by William Watts Taylor (American, 1847-1913), decorated by Matthew Andrew Daly (American, 1860-1937); Manufactured by Rookwood Pottery (Cincinnati, OH, USA); glazed earthenware; Gift of Marcia and William Goodman, 1984-84-8.